PREP COURSE FOR THE NOVEMBER 2, 2019 EXAM BEGINS ON SEPTEMBER 1, 2019. Preparation for the SAT Examination is an important part of college planning. For college-bound juniors, this is an exciting and important time in the college selection process. One step in the college admission process is submitting SAT scores to your child’s prospective schools. In anticipation of the SAT Exam, we have received many inquiries regarding our highly successful SAT Prep Course. Your child’s academic progress is important to us. So, we want to ensure that your son or daughter will have the opportunity to enroll in one of our very popular courses. CERTA specializes in small, personalized classes—and they fill up quickly. We guarantee that our class sizes are never more than 7 students. 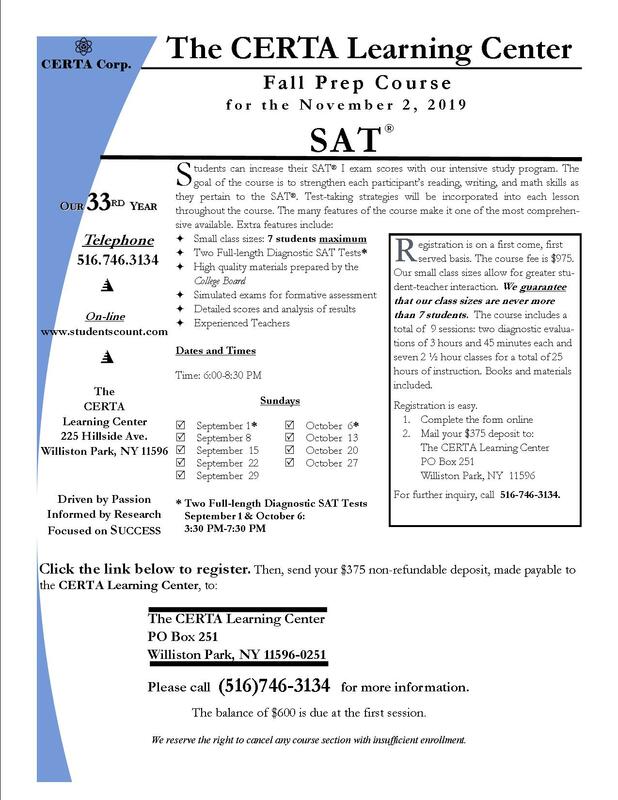 Please complete the following form for the Fall SAT Prep Course offered at The CERTA Learning Center.